Provides tips on searching and manipulating data from the Penn World Tables in Data Planet Statistical Datasets and Data Planet Statistical Ready Reference. 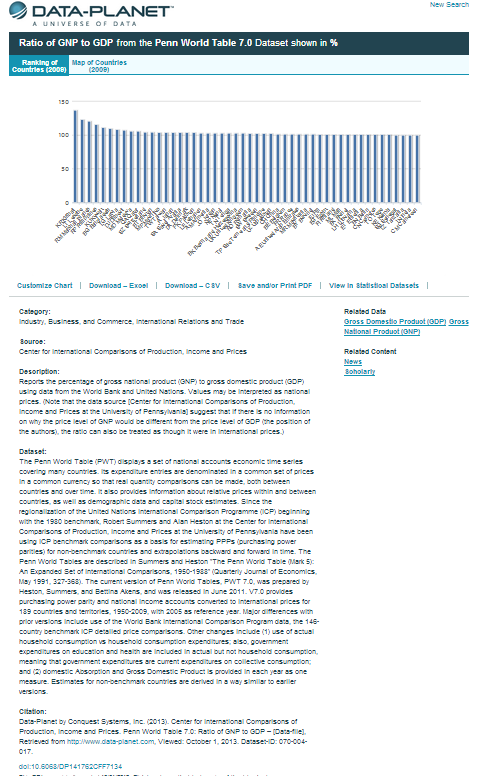 The Penn World Tables (PWT) display national accounts economic time series covering many countries. Its expenditure entries are denominated in a common set of prices in a common currency so that real quantity comparisons can be made, both between countries and over time. It also provides information about relative prices within and between countries, as well as demographic data and capital stock estimates. The indicators below are linked to DataSheets. These are just a sampling from Penn World Table 8.0 to give you an idea of the granularity of the available data. Compare these statistics to the recently released data from Penn World Table 9.0, which extends the range of coverage to 2014 from 2011, and the number of countries has increased from 167 to 182. The reference year in version 9.0 is 2011, as compared to 2005 for earlier releases. Add search terms for countries and other metrics of social and economic development. Contact your library staff for help in formulating your search strategy. Expenditure-Side Real GDP at Chained PPPs - Shows expenditure-based real gross domestic product (GDP) in millions of 2005 US dollars at chained purchasing power parity (PPP) rates. Expenditure-side real GDP allows comparison of relative living standards across countries and over time. Output-Side Real GDP at Chained PPPs - Reports expenditure-based real gross domestic product (GDP) in millions of 2005 US dollars at chained purchasing power parity (PPP) rates. Output-side real GDP allows comparison of productive capacity across countries and over time. Population - Reports population data by country from the World Bank and United Nations sources. Number of Persons Engaged - Per person engaged is defined in the Penn World Table (PWT) to include all persons aged 15 years and over, who during the reference week performed work, even just for one hour a week, or were not at work but had a job or business from which they were temporarily absent. Average Annual Hours Worked by Persons Engaged - Reports average annual hours worked by persons engaged. Per person engaged is defined in the Penn World Table (PWT) to include all persons aged 15 years and over, who during the reference week performed work, even just for one hour a week, or were not at work but had a job or business from which they were temporarily absent. Index of Human Capital per Person - Provides an index of human capital per person, which is related the average years of schooling and the return to education. Expenditure-Side Real GDP at Current PPPs - Reports expenditure-based real gross domestic product (GDP) at current purchasing power parity (PPP) rates in terms of the prices in that period (ie, current prices). Expenditure-side real GDP allows comparison of relative living standards across countries and over time. Output-Side Real GDP at Current PPPs - Reports output-based real gross domestic product (GDP) at current purchasing power parity (PPP) rates in terms of the prices in that period (ie, current prices). Output-side real GDP allows comparison of productive capacity across countries and over time. Capital Stock at Current PPPs - Reports capital stock levels in terms of the prices in that period (ie, current prices). TFP Level at Current PPPs (US=1) - Reports total factor productivity (TFP) levels at constant purchasing power parity (PPP) rates relative to the US in terms of the prices in that period (ie, current prices). TFP is the portion of output not explained by the amount of inputs used in production. Real GDP at Constant 2005 National Prices - Reports real gross domestic product (GDP) at constant (2005) national prices. Real GDP in the Penn World Table means GDP converted to international dollars using purchasing power parity (PPP) rates. Capital Stock at Constant 2005 National Prices - Reports capital stock levels in terms of the constant (2005) prices. TFP at Constant National Prices (2005=1) - Reports total factor productivity (TFP) levels at constant (2005) prices against the reference year, 2005. TFP is the portion of output not explained by the amount of inputs used in production. Share of Labour Compensation in GDP at Current National Prices - Reports the share represented by labor income in gross domestic product in terms of the prices in that period (ie, current prices). Exchange Rate, National Currency/USD (Market+Estimated) - Reports the exchange rate (national currency vs US dollar) for a period in national currency. Market exchange rates are replaced by estimated rates whenever price levels spiked due to misaligned exchange rates. Price Level of CGDPe (PPP/XR), Price Level of US GDPO in 2005=1 - Shows the price level of expenditure-based real gross domestic product per capita (CGDPe) at current purchasing power parity (PPP) rates, defined relative to the US in 2005. Expenditure-side real GDP allows comparison of relative living standards across countries and over time. Price Level of CDGPo (PPP/XR), Price Level of US GDPO in 2005=1 - Shows the price level of output-based real gross domestic product per capita (CGDPo) at current purchasing power parity (PPP) rates, defined relative to the US in 2005. Expenditure-side real GDP Output-side real GDP allows comparison of productive capacity across countries and over time. Correlation between Expenditure Shares of the Country and the US - Shows the correlation between expenditure shares in each country and the US for all benchmark observations. Statistical Capacity Indicator - Provides an index of the statistical capacity of nation based on a scale of 0-100, with 0=weak statistical capacity and 100=high statistical capacity. Statistical capacity is the ability of countries to meet user needs for good quality statistics, typically those statistics that are consider to be “official” (ie, those statistics produced by governments as a public good). The measure is sourced from the World Bank. Share of Household Consumption at Current PPPs - Reports the share of output-based real gross domestic product (GDP) per capita that is represented by household consumption, where GDP is converted using current purchasing power parities (PPPs). Output-side real GDP allows comparison of productive capacity across countries and over time. Share of Gross Capital Formation at Current PPPs - Reports the share of output-based real gross domestic product (GDP) per capita that is represented by capital formation (investment), at current purchasing power parities (PPPs). Output-side real GDP allows comparison of productive capacity across countries and over time. Share of Government Consumption at Current PPPs - Reports the share of output-based real gross domestic product (GDP) per capita that is represented by government consumption, at current purchasing power parities (PPPs). Output-side real GDP allows comparison of productive capacity across countries and over time. Share of Merchandise Exports at Current PPPs - Reports the share of output-based real gross domestic product (GDP) per capita that is represented by merchandise exports, at current purchasing power parities (PPPs). Output-side real GDP allows comparison of productive capacity across countries and over time. Share of Merchandise Imports at Current PPPs - Reports the share of output-based real gross domestic product (GDP) per capita that is represented by residuals and statistical discrepancies, at current purchasing power parities (PPPs). Output-side real GDP allows comparison of productive capacity across countries and over time. Residuals include trade, eg, trade in services. Statistical discrepancy is included to ensure that expenditure-side accounting adds up to GDP in the national accounts data. Share of Residual Trade and GDP Statistical Discrepancy - Shows the price level of the share of output-based gross domestic product (GDP) that is represented by household consumption. Price Level of Household Consumption, Price Level of US GDPO in 2005=1 - Shows the price level of the share of output-based gross domestic product (GDP) that is represented by household consumption, relative to the price level of output-based GDP in the US, where 2005=1. Output-side real GDP allows comparison of productive capacity across countries and over time. Price Level of Capital Formation, Price Level of US GDPO in 2005=1 - Shows the price level of the share of output-based gross domestic product (GDP) that is represented by capital formation (investment), relative to the price level of output-based GDP in the US, where 2005=1. Output-side real GDP allows comparison of productive capacity across countries and over time. Price Level of Government Consumption, Price Level of US GDPO in 2005=1 - Shows the price level of the share of output-based gross domestic product (GDP) that is represented by government consumption, relative to the price level of output-based GDP in the US, where 2005=1. Output-side real GDP allows comparison of productive capacity across countries and over time. Price Level of Exports, Price Level of US GDPO in 2005=1 - Shows the price level of the share of output-based gross domestic product (GDP) that is represented by exports, relative to the price level of output-based GDP in the US, where 2005=1. Output-side real GDP allows comparison of productive capacity across countries and over time. Price Level of Imports, Price Level of US GDPO in 2005=1 - Shows the price level of the share of output-based gross domestic product (GDP) that is represented by imports, relative to the price level of output-based GDP in the US, where 2005=1. Output-side real GDP allows comparison of productive capacity across countries and over time. Price Level of the Capital Stock, Price Level of US in 2005=1 - Shows the price level of the share of output-based gross domestic product (GDP) that is represented by the capital stock, relative to the price level of output-based GDP in the US, where 2005=1. Output-side real GDP allows comparison of productive capacity across countries and over time.